Nov. 5, 2013, 4:52 a.m.
What no-one seems to touch on is the ever increasing housing bubble in China! When that one pops, the whole world is going to feel it becaquse the Chinese are going to call in their U.S. loans which will set off a world-wide recession! It will be ugly! Get your financial houses in order because 2014 is going to be a doozy. Nov. 4, 2013, 9:41 a.m.
At the risk of sounding like a “puckish bloke” I need to comment on the Motley Fool chart showing the internet and housing bubbles. 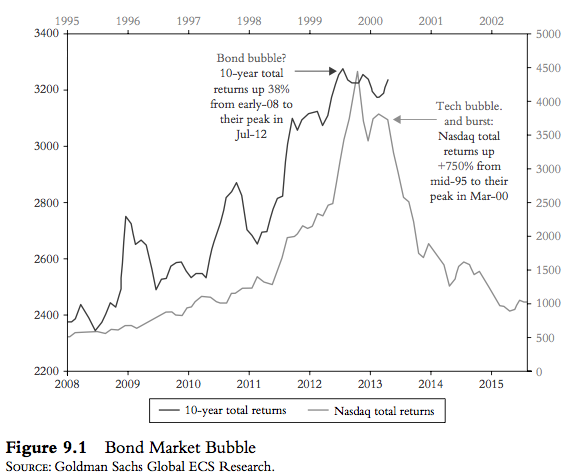 When they publish this chart 12-18 months from now, the current peak will be called the Social Media Bubble. TWTR is due to IPO on Nov 15. FB rolled over after its earnings call. LNKD has dropped as well. 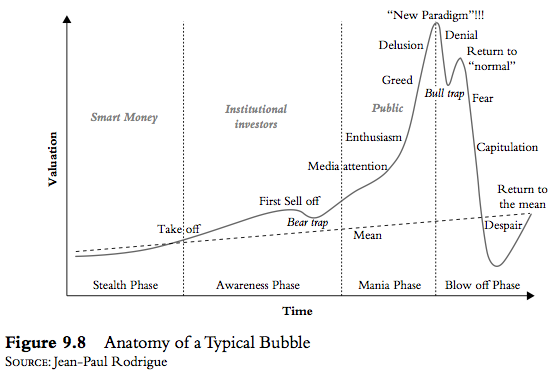 I think that the bloom is already off the rose for Social Media, and the TWTR IPO may be the catalyzing event for popping the current bubble. During the dotcom heyday, everyone was preoccupied with hit counts and the “new economy” and forgot that if the number of consumers remained relatively constant, the amount of goods and services sold would remain relatively constant as well. Today, everything I read and hear is “what is your company’s social media strategy?” as if a company’s tweets are more crucial than producing quality goods and services. In fact, take any headline from the late 1990’s and replace the word “internet” with “social media” and you will find little difference from current headlines. Nov. 3, 2013, 11:46 p.m. I second the comment re John Mauldin’s ability to dumb down a subject as vast and incomprehensible to mundane mind as this article. To demonstrate that I learned something from it, please allow me to reveal to you the significance of your last comments about feeling in overwhelm as you attempt to grapple with the celebrity of a full emailbox, a busy business schedule, and doctor’s visits, adding into the mix iron-pumping routines and human pretzel yoga routines. 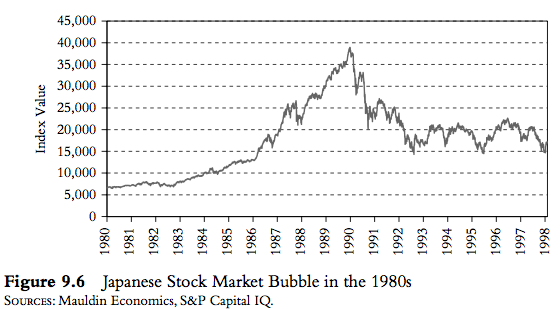 You have simply reached the delusion stage of the mania phase (see Figure 9.8) of the particular bubble we call success. Not to worry—you won’t have to keep it up for long . . .
May I not be a prophet, and may you continue to shed the warm light of sense into this fogbank of an economy. Nov. 3, 2013, 10:42 a.m. Excellent question from Brett Darken. People throw around the statement that stocks are not real assets. Why not? when they represent ownership of productive real assets. The whole concept of real assets is probably idiotic and CERTAINLY has done much damage as fools bought gold, at the peak, on that basis. Nov. 3, 2013, 10:39 a.m.
Perhaps John could address money supply versus wealth. Welkath vastly exceeds Mooney supply. Wealth is MEASURED in money. All money is wealth. All wealth is not money. A house is not money as such. It is worth money. Nov. 3, 2013, 10:36 a.m. I am with Ned Williams above. The common description that excess money supply flows into stocks is misleading as to what happens. As Ned says when one buys another must sell, money passes through markets it does not reside in markets. 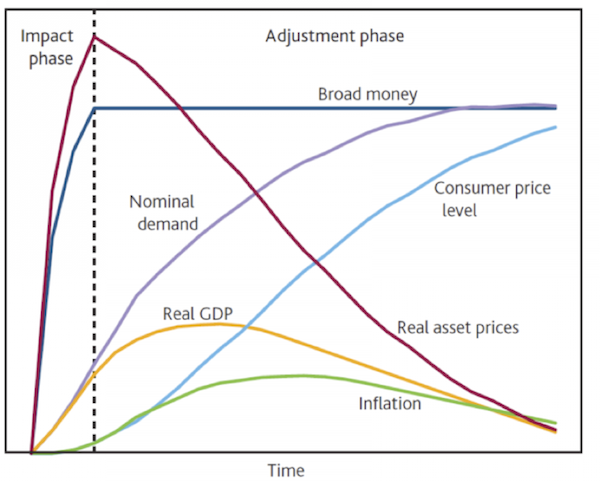 The actual mechanism is more that additional money supply is manifested as easier ability to borrow. Fed buys bonds from banks leaving banks with cash that they wish to lend. Easier borrowing allows the prices of everything and especially assets to be bid up. The money does not go into stocks but additional loans do allow stock prices to be bid up. Nov. 3, 2013, 9:46 a.m.
That was rather a cheap shot, John. I’m disappointed. Nov. 3, 2013, 2:02 a.m.
Chatting with friends we are puzzled by the persistent steadiness of the stock market under extreme conditions. 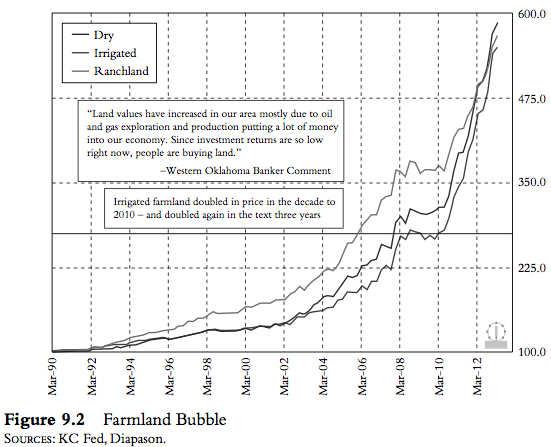 If the underpinnings are falling apart, yet prices hold, is this a disguised bubble? When the larger players dare not sell that there are so few retain investors managing their own money, what do the prices mean? Nov. 3, 2013, 1:18 a.m.
“The difference between genius and stupidity is that genius has its limits. A pleasing quip. But not Einstein’s. Wikiquote says of this attributed remark: “From William Bruce Cameron’s Informal Sociology: A Casual Introduction to Sociological Thinking (1963), p. 13. The comment is part of a longer paragraph and does not appear in quotations in Cameron’s book, and other sources such as The Student’s Companion to Sociology (p. 92) attribute the quote to Cameron. Nov. 2, 2013, 11:59 p.m.
A few points: first, the margin debt chart suffers from a few weaknesses. 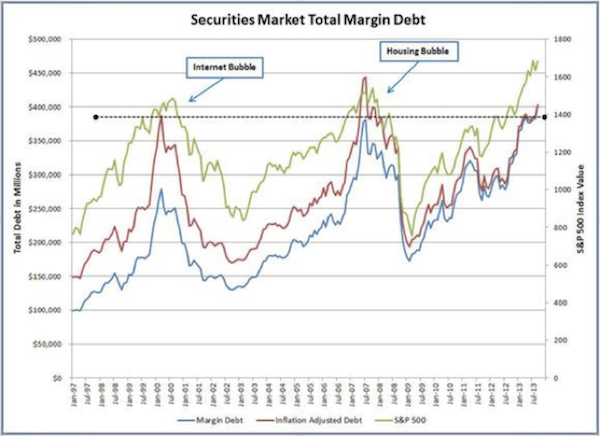 The margin debt chart would be far more interesting if it went back another few decades. Given the impact of credit cycles on asset prices and economic activity, it makes sense that swings in the speculative end would have outsized impact, particurly on equity prices. It would be interesting to look at this back to the 1970s. A second point would be - what is the causal relationship? Does reigning in of margin start the top of prices, or is it the fall of prices which causes margin debt to be liquidated? However, there may be less than meets the eye, because, margin debt is a nominal liability, so in a world of inflation, it will rise over time. 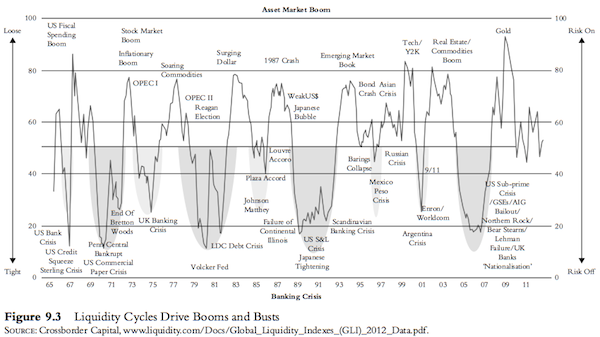 True, so long as cyclical variations tightly map to equity price performance, it is something to monitor. But the chart (perhaps the Motley Fool, whence it came) chose to draw a horizontal trend line, as though to say “we have passed the breaking point”. But this line should be upward sloping given the fact that prices are also upward sloping. In which case, we may well be far from the limit. (2 years, in my estimate). 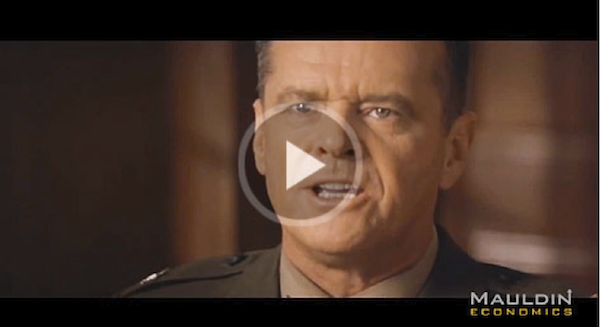 A second point - you make a caveat about gold. I chuckle. The argument that gold prices responded naturally to changes in inflation expectations belies the fact that from 1982-2001 prices rose, and gold fell. 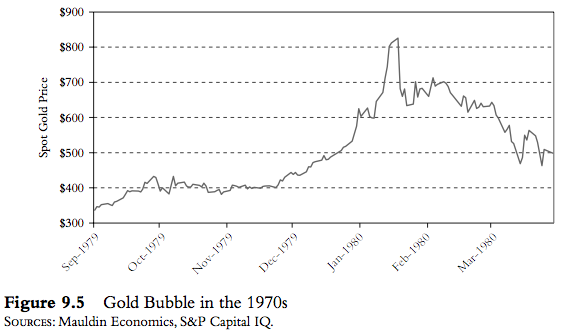 If gold were such a great inflation hedge, it should have continued to rise. 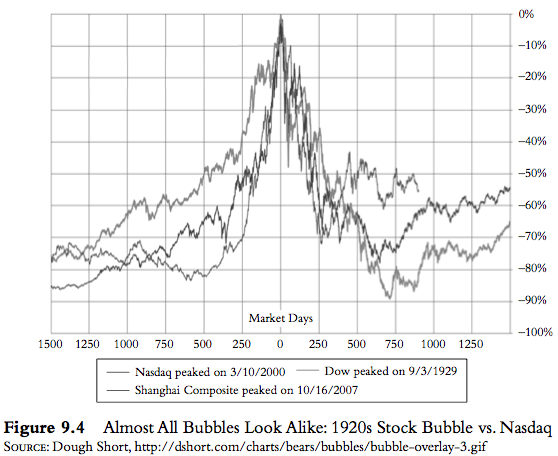 To argue that 850 was not a bubble because prices corrected when expectations changed is like saying NASDAQ 5000 wasn’t a bubble because it corrected after expectations for internet firms changed. Finally, it iw worth noting that people like Ed Easterling have a credible explanation for high P/Es that have to do with inflation, and suggests that stock, at least, are modestly overvalued (but hardly in bubble territory) due to low inflation and low inflation expectations.